OpenCrowd is a design and technology firm creating custom Blockchain business solutions for global clients and early startups. For over a decade, they have applied emerging technologies and helped hundreds of satisfied clients crystallize their new business concepts and accelerate the development of new and purpose-driven applications. The company has established a reputation for building smart applications leveraging blockchain, analytics and machine learning. The team behind OpenCrowd believe decentralized apps powered by machine learning will be the foundation of many cutting-edge innovations in the future. The team is also armed with a development partnership with two emerging Blockchain technology platforms, Hashgraph and Securrency. Their aim? too simply help their clients adapt to these innovations quickly by offering custom services such as enterprise blockchain solutions and smart analytics applications with simplified UX. 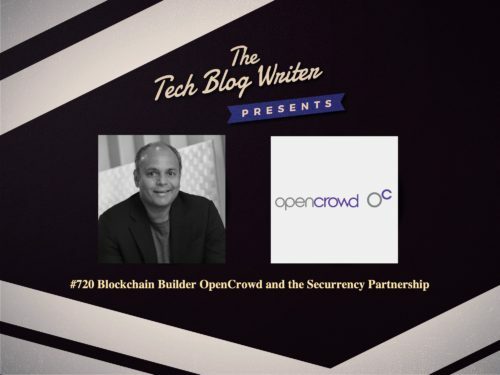 I invited OpenCrowd, CEO, Sushil Prabhu onto my daily tech podcast to learn more about his story and the future vision of the company. As CEO, Sushil spends a significant part of his time consulting with clients on the benefits of advanced technologies to produce economic results. Prior to joining OpenCrowd, Sushil was Head of Professional Services at CXO Systems responsible for managing client delivery.